Our new Inflatable basketball slam dunk arena can handle 12 to 15 basketball players at a time and comes with 6 Nerf mini basketballs. Basketball dunking games are always a big hit and can be used as a slam dunk compitition, sports themed parties or company picnics as an activity for kids or adults. Inflatable basketball games can be used as a team building activity or dunk challenge as part of a basketball dunking contest. Did we mention this game is huge so be sure to measure your area to make sure it will fit. 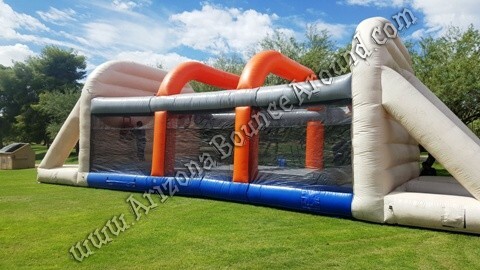 This Inflatable is also perfect for people looking for a giant bounce house with basketball hoops inside with a bounce area that's 20 feet wide and 28 feet long, thats huge for a bounce house. We are your basketball game rental superstore serving all of Colorado with sports games and activities for kids and family events. We rent lots of other basketball games, professional basketball hoop rentals and mini electronic basketball games just to mention a few. This inflatable basketball dunking game price includes standard set up. Standard setup is considered an area within 80 feet of sufficient electrical supply. Delivery and removal within included delivery area with no restrictions for delivery, set up or pickup.